It might have been a mucky job, but Falmouth YFC's annual dung run certainly proved profitable as the club are celebrating raising more than £2,500 from their hard work. The proceeds raised from the event will be split between the Sunrise Cancer Centre at the Royal Cornwall Hospital, Breage Pre-School and Falmouth YFC. The annual Dung Run involved 30 members donning their wellies to fill over 1,000 bags of cattle manure and then jumping in tractors to deliver to gardens, allotments and flowerbeds across Falmouth and its surrounding areas. Club Chairman Ben Coleman said: "Being a Young Farmer is not just about tractors, cows and flat caps - it's so much more than that." "Young Farmers is all about getting to meet like-minded people, to have fun and to learn new skills – and if in doing so, we can benefit local causes - then it makes being a member of YFC even more worth it." 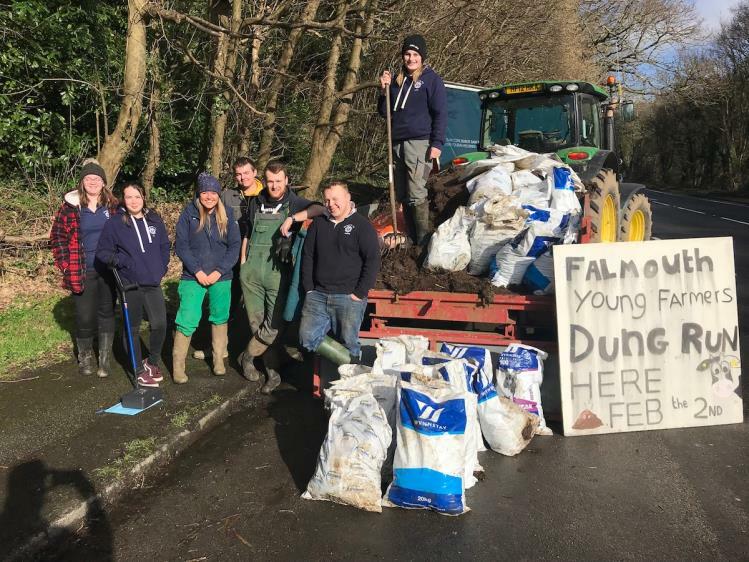 Falmuoth YFC is one of 20 YFC Clubs that make up the Cornwall Federation of Young Farmers’ Clubs and has around 28 members. The Dung Run is just one of the fundraising events the club hosts annually. The club would like to thank everyone that kindly purchased bags of dung and also to the donors of the dung, the bags and the vehicles for delivering. The Farm Safety Partnership (FSP), which includes NFYFC, is focusing on handling livestock safely in the second phase of its farm safety campaign. NFYFC will be joining the farming industry to promote good practice when it comes to handling livestock. Incidents involving livestock are the second biggest overall cause of fatal injury in the farm work place second only to transport. Select, use and maintain well-designed handling facilities. Be extremely cautious when entering a cattle enclosure and always have an escape route. Remove aggressive animals from the herd. Separate livestock from the public wherever possible. David Goodwin NFYFC AGRI Steering Group Chairman said: “It's important that young farmers understand the risks of managing livestock and take steps to better manage those risks. "NFYFC will be supporting the FSP with these key safety messages to ensure the next generation of farmers are leading the way when it comes to farm safety." For more information and guidelines or to follow the discussion on social media, use the hashtag #FarmSafetyPartnership. YFC members are being offered the chance to visit a LEAF (Linking Environment and Farming) demonstration farm – Clacks Farm, (part of Crowmarsh Battle Farms Ltd) – to learn more about conservation management and running a sustainable business. The farm visit, which has been set up by the NFYFC AGRI Steering Group, will give 20 YFC members a free opportunity to discuss diversification projects, conservation and arable farming. YFC members will see Crowmarsh Battle Farms Ltd's whole farm approach, where rotations, the selective use of inputs and efficient use of resources is balanced with planned environmental management to make a truly sustainable business. The Chamberlain family has been farming at Benson for over a hundred years and Philip Chamberlain is the third generation to run the family business. The farm is an all arable enterprise of 3000 acres. Conservation management has always been seen as complementary to profitable arable farming and Crowmarsh Battle Farm follows LEAF and Integrated Farm Management (IFM) principles. The evening will be a great opportunity to further the future environmental land management system conversation started at the YFC AGRI Take Control of Your Future event at Bakewell in February. There are twenty places for this free event and places will be allocated on a first come, first served basis. Visit EventBrite to book your tickets. It might be a rubbish job – but a litter pick by Vale O Lune YFC in Lancashire brought the club together and made a difference to their local community. 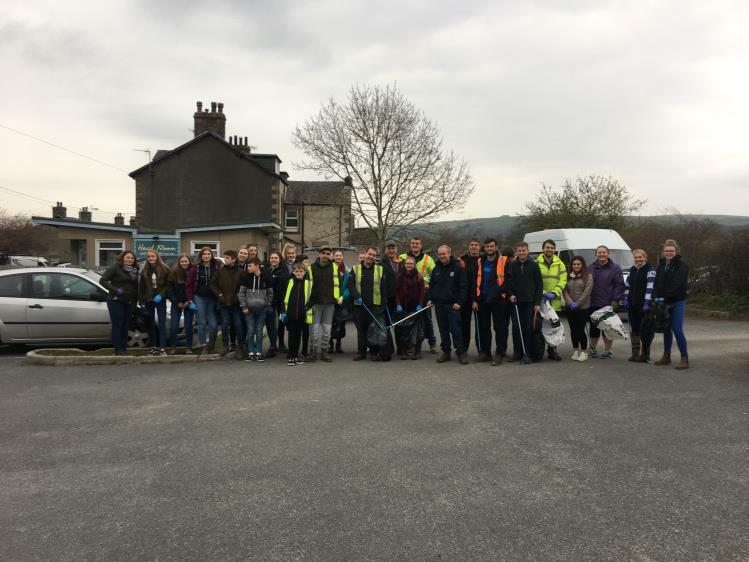 The club wanted to do something positive to support NFYFC’s Protect Your Future campaign and took inspiration from the fact the Great British Spring Clean is running from the 22 March – 23 April. Thirty members cleared litter along three miles of cycle track that runs between car parks in Bullbeck and Denny Beck. The areas are used regularly by YFC members and the local community and are now looking a lot smarter since the club filled bags of rubbish using litter picking tools donated by David Hartley Towing and Training. If your club wants to get involved in the Protect Your Future campaign, visit the campaign pages. The National Federation of Young Farmers’ Clubs (NFYFC) – the largest rural youth organisation in the UK – has identified three major issues to focus on that are having a detrimental impact on rural young people’s lives today. Three key areas of concern affecting rural young people are inconsistent and poor levels of connectivity in rural areas, the pressures associated with the future succession of a family business and the high level of unspoken mental wellbeing issues. NFYFC has responded to these issues with programmes of work to support its network of 24,500 members that live and work in rural areas across England and Wales. NFYFC has collaborated with industry organisations and government to develop training and materials that help raise awareness of the problems and highlight where to access support. Katie Hall, NFYFC’s Chairwoman of Council, said: “Connectivity, succession issues and mental wellbeing are three key issues we believe are having a detrimental impact on rural young people today. Our 615 YFCs offer a social network to many rural young people and are focused on helping their members to have fun, learn and achieve through our varied programme of activities and training support. The report showed that a basic phone call cannot be made inside 33% of rural buildings on all four mobile networks (EE, Three, O2 and Vodafone). It’s an issue that NFYFC’s Agricultural and Rural Issues (AGRI) Steering Group has included in its AGRI Manifesto. Broadband connectivity is a major issue for rural and agricultural businesses – especially those wanting to advance their systems with new technology. A lack of public transport also reinforces social isolation – especially for those who cannot drive or do not have access to their own vehicle. Many of YFC members live in remote locations, often miles away from the nearest town. Kate Wainwright, Derbyshire Federation of Young Farmers’ Clubs member and a member of the AGRI Steering Group said: “Connectivity is an issue that has been raised time and time again by rural young people. It’s still a problem and there’s still a lot of work to do in this area. An NFYFC and Farming Community Network (FCN) survey in 2014 asked young people with a farming background about their hopes for the future and, among the major concerns highlighted were low incomes (50%), an inability to save for the future (45%), the limited opportunities for them to start farming (32%) and the lack of rural housing (55%). Social isolation and a lack of opportunities in rural areas are both contributors to poor mental health. To help raise awareness of mental health issues, NFYFC worked with FCN to develop a session called Rural+ that YFCs can deliver at a club level. The sessions, delivered in conjunction with trained professionals from mental health support organisations, aim to get young people talking about the stigmas associated with mental health, to recognise the signs and symptoms, and know where to get support. The club sessions were launched off the back of a mental health awareness campaign that was launched by NFYFC in 2014 called Rural+. Alice Giles, a YFC Trainer from Devon Federation of Young Farmers’ Clubs said: “This course is a brilliant way to encourage young people to talk about their mental health and be aware of where they can get support. A quarter of farm businesses do not have a nominated successor,* which can be a cause of stress for everyone invested in a family business. NFYFC released a video We Really Need to Talk and support guides in 2018 to help young people start the conversation about succession and highlighted the importance of financial and business planning. NFYFC is now set to launch a new training module called Ready and Resilient, in conjunction with Savills and Siân Bushell and supported by Defra. It has been developed for YFCs to deliver; helping to raise awareness of the issues surrounding succession and generational renewal. The project aims to encourage more families to start succession planning in their family businesses – and not just related to farming. NFYFC is also keen to promote the opportunities available to young people to farm – and not just through succession of a family farm. New business opportunities such as share farming and many roles within the food and farming industries are all considerations for those with an interest in agriculture. A new NFYFC project with LEAF Education called Future Farming is also focused on promoting the wide-range of jobs available in the agricultural sector – and not just those related to working on a farm. “NFYFC is focused on supporting the industry with a culture change in farming. Succession can be a key area of concern for young farmers or any young person involved in a family business. Planning ahead is vital so everyone in the business understands and agrees on the best future possible.